We started in Greenwich in 2005. We started working regularly in NYC in 2008 after the first national story appeared in The New York Times. I was fund-raising in Greenwich for an addiction recovery outreach program (I am a recovered addict for 29 years). Wall Street just crashed and my main donor lost $30 million in the market. She handed me a final check and then I witnessed the demolition of the Queen of Iran’s Rockefeller Mansion in Greenwich. I had the inspiration at that moment . . . “Why not sell the kitchens and gorgeous fixtures out of mansions being demolished and earn the money rather than ask for it?” Six months later the Greenwich Time Real Estate section wrote a feature story on the idea and we received 36 calls. The rest is history . . . Renovation Angel created the only white-glove, nationwide luxury kitchen recycling program. We are an “entrepreneurial charity,” earning non-traditional revenue through demolition and renovation donations. Renovation Angel transforms a wasted resource, thousands of luxury kitchens headed to overcrowded landfills, into millions of dollars’ worth of new jobs and funding for other charities – feeding hungry children and job training for youth-at-risk. Since 2005, over $17 million of jobs created, over $2.2 million distributed to other non-profits, and over 29 million pounds diverted from the landfills. 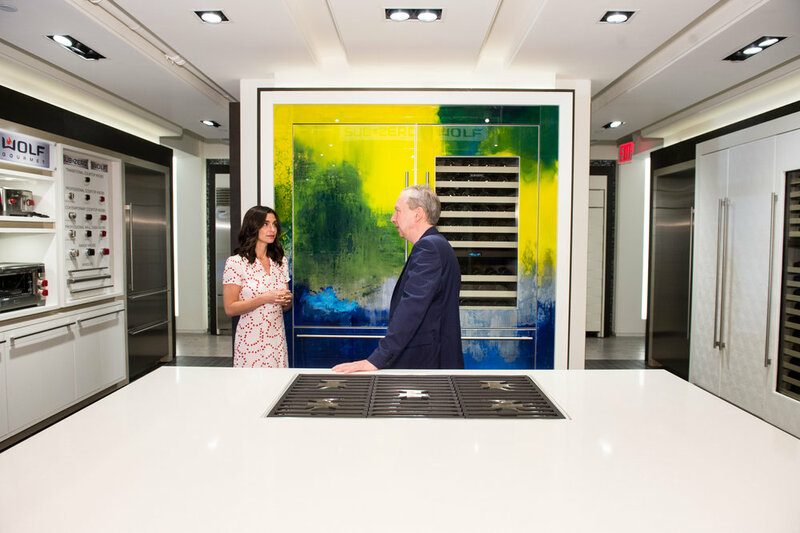 Renovation Angel discovered a market void in America – the recycling and repurposing of pre-owned luxury kitchens, furniture, and renovation items. Donors receive a full tax deduction and free, white-glove, insured removal. Consumers can purchase “luxury bargains” at a 43,000-square foot retail showroom in Fairfield, NJ. Our donors are high-net worth property owners including members of the Forbes 400, celebrities, and sports stars. Our longevity relates to two things – one, our wonderful team which receives numerous kudos from the donors and industry professionals, and two, our unique luxury recycling process, taking a project from start to finish seamlessly. Several ways. The first is financially – donors receive a full tax deduction and free, professional, white glove removal. The demo of a small kitchen in NYC is $5,000, a large one is over $10,000. The second is environmentally – our donors get a good feeling knowing they are reducing landfill waste and protecting the earth by repurposing their kitchen and renovation items. The third is charitably – our donors love the fact they are supporting job creation and earning funds for other non-profits. They also appreciate that we do not fundraise or receive government grants. Telling my story - every donor I talk to hears a brief history of Renovation Angel and how we are positively impacting the world. I love seeing people get inspired to both donate and tell others about Renovation Angel. For recycling – The Upper East Side and The Upper West Side. For food – Bare Burger and ABC Kitchen. Mamas are busy – so they appreciate that Renovation Angel handles all aspects of the luxury recycling process - from the first call to the final tax paperwork. Most projects are completed in one day and their space is left clean swept! There a few people who really stand out. Jeff Moore, President of Sub-Zero Group East. When Jeff heard about us in 2009, he loved the idea of Renovation Angel which lead to our partnership with Sub-Zero and Wolf. Jim Bilotta, President at Bilotta Kitchens in Manhattan, Mamaroneck, and Mt. Kisco. Jim discovered us in 2005 and has supported Renovation Angel through numerous referrals of luxury kitchen projects. Jonathan Zanger President of Walker Zanger. saw the value of creating a nationwide “awareness partnership” with Renovation Angel in all 13 Walker Zanger showrooms and through positive press and social media. Best advice – Jim Henderson, Owner of William C. Huff (Luxury logistics/movers). “Focus on luxury.” It was a game changer for Renovation Angel. My Mantra – Do the right thing, and success will follow. Never give up, there is a new opportunity waiting around the corner. Take 5 minutes in the beginning of the day to write down the “must-do” items and everything that needs to get down. It’s always easier to work off a to-do list. It feels good to check things off the list!